SEO can be a time-consuming process, so any opportunity I have to use great SEO tools to help us rank better, I take it! These SEO tools can help you with everything from keyword research, content sharing, backlink analysis, broken links, redirects and much more. Irina Weber from SERanking.com is here today, to enlighten us as to which tools are the most productive and best organized to help you succeed as a blogger. Irina and her team have tested many tools of top productivity and blogging experts and have a good idea of what top performers in the blogging world are using to get through the day in a highly productive manner. BuzzSumo is a fantastic tool that allows you to search widely shared content through social networks, gather all data about the content, define top influential content curators in your niche and collect statistics about all of them into Excel spreadsheets. It’s easy to use: just type a word and it will show you all the most popular posts on the web based on that particular keyword. SEMRush is a great tool that tells you a lot about not only your own website but your competitors search engine rankings too. The most interesting information they share is what keywords a website ranks for. This information is useful because, you can see what posts don’t rank at all and which rank well but could be improved. SE Ranking allows you to monitor website rank in search engines and any target regions. It provides advanced keyword analysis, website audits, competitors’ website checking, online marketing plans with an easy way to get White Label reports. If you’re looking for good ideas and titles to write epic content, just enter a keyword and you’ll get a list of catchy potential titles for your next article. This is a great tool where you can write and store content and check for any grammar and spelling mistakes. For more advanced features, you can easily change the HTML or CSS of the document and even collaborate with other people, in case you need some help. Nowadays infographics are the best way to cover visual and interesting information on your site and attract your target audience. It is quite expensive to order infographics, but Piktochart will help you to create your own for free. Pie charts and graphs can also be pretty to attract user’s attention. We’ve found it to be a great addition to the professional looking landing pages that you can create with OptimizePress. Screenpresso can improve your screen capture experience. Right now with ScreenPresso, screenshots can look natural and eye-catching. Their powerful built-in editor allows you to grab an image or video of what you see on your computer screen, add effects, and share with anyone. Doodle makes your blogging simple and more organized. Using a content calendar will help you to figure out how often and when you should schedule your blog posts. The tool facilitates the content process and gets rid of excess distractions. It is one of the most popular tools to store things like images, pdf files, and Word Docs between mobile devices and computers. You can keep your files secure wherever you go. Dropbox is easy to use; Simply save your files, add them to the tool and sync them with a supported app. The tool simplifies the writing and editing of all blog posts. It is one of the most famous blog editors on the Windows platform. You can easily edit blog posts, images, videos, etc. You can also add additional features with lots of useful plugins. It is one of the best pinging services to let search engines know about your new posts. You can choose different services that you want to ping. All services are regularly updated, so make sure you take advantage of the most useful ones. 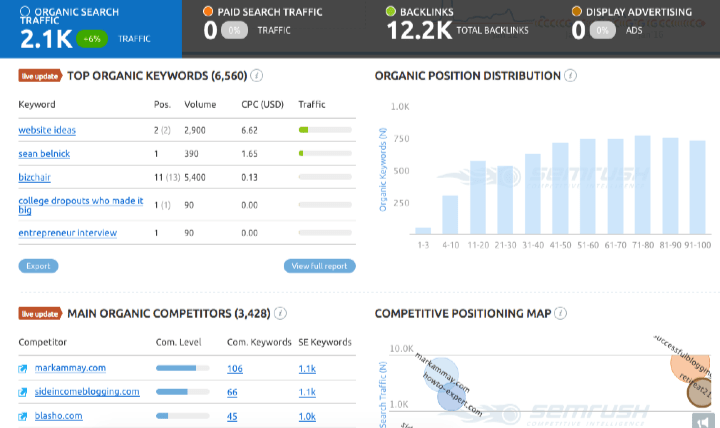 Keyword Planner is the best tool to find and discover keywords in order to optimize your content, build up successful marketing campaigns, gather metrics about websites and get an estimate of search queries for target keywords. You can monitor and export your competitor’s keywords for better website performance. A lot of useful tools are built-in so the Keyword Planner can help you to create paid Ad words campaigns easily. A super simple time tracking tool, that helps you stay on track. It lets you create tasks, click the Start/Stop button, check out how the task is going and how much time you spent on it. It works online and offline and easily syncs to the cloud when you’ve reached the internet. It is quite an indispensible tool for bloggers who need to keep track of writing, editing and researching tasks. The tool makes your writing better by finding and fixing grammar mistakes. It checks different mistakes for sentence structure, style, grammar, spelling, punctuation, etc. It is a perfect match for a newbie and you don’t need to have any special editing skills. It is the most-used image software and it’s because Canva allows you to create fancy and awesome images with a wide range of different templates for social media, website interface, fonts and more. It is a great real-time media monitoring tool. Mention is a great alternative to Google Alerts. It lets you track the keywords and mentions about your website, whether it’s positive, negative or neutral content. Using Mention you can also collaborate with your employees; share alerts, assign tasks, get them involved in the discussion and keep track of your competitor’s actions. MailChimp is a great email marketing tool that helps send emails to a list of your users, create great email campaigns, manage all of your subscribers, share them on social media and integrate with any web services you use. 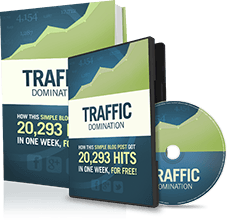 It is easy to get automated campaigns every day that deliver all new posts you write. It is integrated with Google Analytics for better business insight. When you publish a blog post, you can easily set up a schedule with Buffer. It will help you share different posts via social networks with custom images and titles. This is the greatest social media app, and it really makes it easy to update all of your social statuses. KeePass is a free and easy-to use password management tool. All passwords are stored in your own database with a master password to lock/unlock the database. The tool is available for iOS, Android, Mac OS X and Linux. Moz Toolbar is a great and powerful tool that provides access to all important SEO metrics, allows you to explore page elements, displays PR and domain rank, shows social metrics, and analyzes page overplay. Screaming Frog allows you to explore all onsite SEO. It is a good tool to use when reviewing medium and large websites. All key on page SEO elements (headline, meta tags, URL, interlinking, duplicate pages, redirect, etc) are exported to Excel. It is useful to check out all SEO recommendations that you use for better onsite SEO optimization. Rapportive is a free Gmail add-on that displays everything about your contact’s (Twitter, FB, LinkedIn) on your inbox. It is easy to contact them without leaving gmail. You can follow them on Twitter and even friend them on Facebook. You can stay in one place, grow your social network and establish good relationships with people all the while, staying on top of emails. Copyscape is the best plagiarism detection software that lets you find out who used your content and create an auto RSS blog with an RSS feed. You can try it free or use the premium version of this service. If you run a lot of projects, you probably need to hire workers to complete certain tasks. In order to increase employees’ productivity, you should always control their daily activities, working hours, etc. WorkExaminer is an excellent employee monitoring tool for effective website performance. Ahrefs is a powerful online backlink checker and site explorer tool that is very easy to understand at a glance. 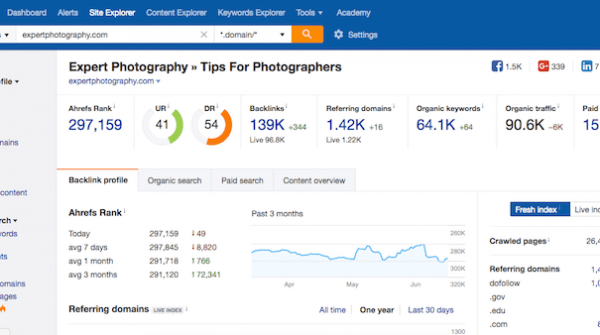 Ahrefs has a suite of useful tools like keyword analysis, domain comparison, batch analysis and competition analysis. It is perfectly designed for web masters and website owners that want to save money and get the most out of their business. Due to its rich functionality and a wide range of toolsets, it is poised to be a large player on the market. We’ve had the privilege to check out many of these tools. As you’ve already figured out, blogging is a hard world to break in. With the right tools, you are sure to improve your chances of success on your blogging journey. As of now, you’ve got a good arsenal of tools to make your blog ready for best of times. Now it’s your turn to share your favorite blogging tools. We’re always happy to discover more about the tools that are out of there and currently working for you! Awesome list. Some of these tools I have been using but many I have not heard of. Thanks for putting this together. Really comprehensive and helpful article Irina.. thank you. There is so much good content here I couldn’t even get to the end. So, now I can’t close this tab until I finish it. Plus, I have four of the products, listed in this article, opened in tabs so I can sign up, research them etc. Got my work cut out for me. This article has grabbed me like no other. Wow. Fantastic list. I had heard of only about half these tools. Thanks so much!